From the creators of the Trout Magnet comes the Crappie Magnet. These lures have become extremely popular among crappie fishermen. Why? Because they outright catch fish! The results have been astonishing for a whole lot of anglers. 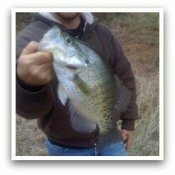 Customers have stated in their reviews about literally catching dozens of crappie in a day from their hometown ponds and lakes, whereas before they couldn't catch a thing. So, what's so remarkable about these crappie lures? Their design looks fairly simple... straight-shafted, cylinder-like body, tapered out with a split tail that is near impossible not to flutter around no matter how hard you try to keep it still while suspended in the water. Nothing too fancy, right? But these little rascals are deadly. They are just too hard for those crappie to pass up. There are a couple techniques to fishing these crappie jigs to get the best results. Either fish these using a float, or by tight lining a vertical jig directly under your boat. It helps to locate the fish on your electronics to figure out where the fish are holding and to decide which method might pan out better. If the fish are holding above 8 feet in the water column, then a slip float or bobber should be the best bet. Adjust the lure under the float just above where the fish are suspended, then fish it as tightly to structure as you can and enjoy the ride. If the crappie are down deep, then vertical tight line should be the ticket. Once you have located the fish on your depth finder then drop your jig straight down until it hits the bottom. Slowly reel in just a little bit to bring it slightly off of the bottom, and enjoy the rodeo. Allow the lure to do the work for you - use as little movement as possible, the crappie love it like that, and you will too. Ultimately, fish your Crappie Magnet lures as close to structure as you can. If the crappie are there, you are going to have a blast. Just because these lures are specifically designed for crappie fishing, it doesn't mean that you can't catch other fish. These are just as great to use for bluegill, shellcrackers, bream, small bass, trout and other small fish. You mean to tell me that you don't have yours yet? Or are you just looking to stock up on some more? Well, you're in luck. We have listed a few of the most popular top selling packages. Click on any of the items below, and if there's a specific color or package that you want then just have a look around or type it into the search box. Are you ready to get magnetized? And to become a magnitude dude? Have fun freshwater fishing for those crappie!